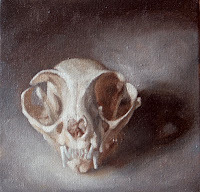 Having been concentrating on faces for a while, I thought it was time to go back to still life, and was searching for something white to paint, when I came across this skull lying around . . . This really lets me explore warm-cool differences, and may become a little series - the next one while be overall much lighter - can't wait to begin!